The Friends of ZDVO and Beit Halochem in Miami, established recently by Tzippy Faye Holand, Avi Samuel, Rafi Blum, Michael Dezer and friends, has become a reality. Last week the Florida Chapter launched its activities with an event for the benefit of the “Beit Halochem Ashdod Project”. 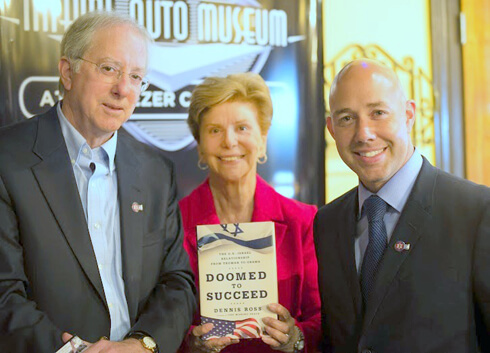 The gathering was held at the the Dezer Auto Museum in Miami, with key note speaker Amb. Dennis Ross who spent the better part of his diplomatic career dedicated to promoting peace between Israel and the Palestinians. Another guest speaker was Brian Mast, US Army disabled veteran who lost both his legs while serving in Afghanistan. Brian Mast was a guest at Beit Halochem last year where he met wounded war veterans from Operation Protective Edge. Guests were shown a promotional video about the work of the ZDVO and Beit Halochem and Rafi Blum’s moving words reached their hearts and pockets. Donations were raised for the fifth Beit Halochem Rehabilitation Center scheduled to be built in the City of Ashdod. A Valentine’s Day Party, attended by over 150 guests and organized by Tzippy Faye Holand, was held two days later at the Trump International Hotel owned by Michael Dezer. It, too, was a Fundraising and Awareness Event for Beit Halochem Ashdod.